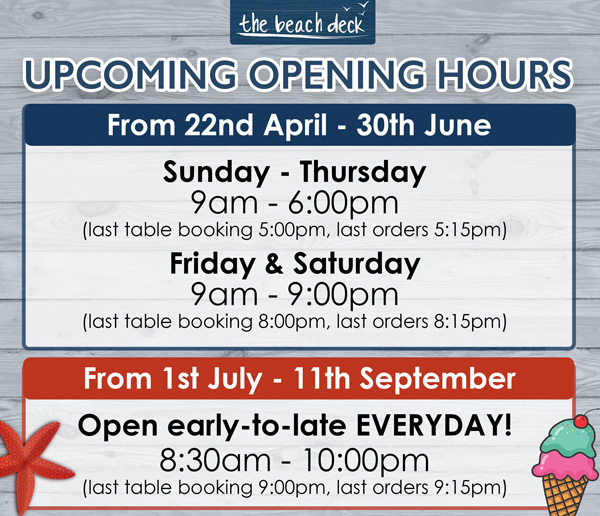 The Beach Deck is one of the few places you can truly relax whilst enjoying one of our delicious dishes & a glass of your favourite wine, or maybe just a nice pot of tea with a slice of cake. **PLEASE NOTE** In the summer months we may stay open later, yet its always good to ring and ask to avoid disappointment. We do not take reservations out on the deck. These tables operate on a first come first serve basis. Dogs are welcome at The Beach Deck. INSIDE: on one side of the restaurant. OUTSIDE: anywhere on the deck, all day long! !